In October of 2012, more than 300 sustainability-minded chefs and food professionals from around the country descended on Seattle, WA for an educational and community-building conference on sustainability in restaurant and food service kitchens. Sessions included topics like beef production methods, managing food costs and the role of chefs as advocates. The year’s theme was “Flavors of a Foodshed,” a nod to the bounty of ingredients in the Pacific Northwest. During the Summit, participants heard from Ruth Reichl, former editor in chief of Gourmet Magazine, Kim Severson of The New York Times, Rowan Jacobsen, author of five books including A Geography of Oysters, chef Tom Douglas of Tom Douglas Restaurants, and many others to discuss food and cooking, culture and sustainability. 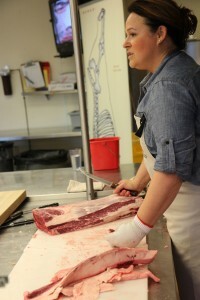 We fabricated goat carcasses, offered in-depth beef butchering lessons and baked with heritage grains. We discussed the challenges of sourcing sustainably raised poultry and looking at traceability and other tools in seafood sourcing, as well as deciphered the nuts and bolts of running a sustainable restaurant. Testimonials from chef attendees: “The highlight of the Summit for me,” says Rich Garcia, executive chef of Boston’s 606 Congress and Boston Local Network Leader, “is the chance to meet chefs I’ve looked up to throughout the course of my career.” Click here to read Rich’s recap of the Summit.